The first time I saw a sleek, blue 1930's Lincoln Zephyr I knew this was one classy car — its teardrop shape and smooth lines were modern and aerodynamic. In 1951 the Museum of Modern Art selected it as one of the 8 best pre-war automotive designs, calling it the first successful American streamlined car. It took its name from the 1934 Burlington Zephyr, a diesel train that set new speed records, but the Lincoln Zephyr's history goes back even further. Henry Ford was a practically-minded inventor and businessman. He was committed to mass production and lower costs but didn't much care what a car looked like so long as it performed well. He thought, for instance, that black was the only exterior paint color ever needed. His only son Edsel, however, a talented landscape artist and sophisticated man about town with an affinity for sports cars, had more interest in automotive styling. As President of Ford Motor Company from 1919 to 1943, he gave the Model T curved surfaces and smoother lines, resulting in increased sales and winning support from his father to introduce more colors. In 1922 he purchased the bankrupt Lincoln Motor Company and, through bodywork design changes and lower prices, had Lincoln operating at a profit by the end of 1923. With the Depression and its aftermath, though, many luxury-car manufacturers were forced out of business. Ford began looking around for a car that looked as impressive as higher-priced models but could be manufactured more cheaply. In 1933 Ford began annual styling changes and turned to the Briggs Manufacturing Company, major suppliers of Ford bodies, for help reaching the medium-priced market. Chief of Body Design there was John Tjaarda van Sterkenberg, a Dutch designer who had come to the U.S. in 1923. Trained in aeronautical design in England and having served as a Dutch Air Force pilot, he wanted to apply aircraft design and construction principles to cars. He started out designing custom-bodied cars for Hollywood movie stars, eventually moving to several years of work at Dusenberg, until the legendary Harley Earl hired him away in 1930 as part of GM's new styling section. In 1932, though, Briggs hired him away from GM. Since 1926 Tjaarda had been working on a series of concepts called the "Sterkenberg", a streamlined "dream car" with a teardrop-shaped body and a sophisticated chassis, all-independent suspension and a rear-mounted engine. By the early 30's W.O. Briggs had taken on more work for Chrysler (which finally acquired Briggs in '53), touching a nerve with Ford. In reaction, Briggs hired Edsel Ford's close friend Howard Bonbright to improve deteriorating relations with Ford. Briggs also recommended to Tjaarda that he show his sketches and scale model to Edsel who was impressed enough to ask for a prototype suitable for volume production. As happened more than once, though, in an effort to keep his father out of the loop and, thus, unable to squash creativity, Edsel directed that the work be done in secrecy. Tjaarda's flair for design certainly appealed to Edsel but in one way Tjaarda was more like Henry: he knew what he liked and wasn't all that bothered with fancy details. Freely admitting that math was not his strong suit, Tjaarda preferred what he called "guessamatics" to actual aerodynamic calculations. And time and public approval proved that he was a pretty good guesser. Later, during an interview in the fifties, Tjaarda explained that initially there had been three proposed designs—rear engine, the same car with front engine, and a draft of a convertible coupe. At the time lots of companies were losing money on convertibles so that was out. The rear-engine proposal was made into a showy, full-sized wood mockup with a louvered fastback roof and the car was touted as able to accommodate a V-8 engine and automatic transmission. That's the version that was displayed at the Chicago Century of Progress Exhibition (1933-34) and in Detroit and New York with Ford's "Exhibit of Progress" road show. A poll of viewers showed that 80% liked the look but only 50% approved the rear engine placement; Ford decided to build a front-engine version instead. 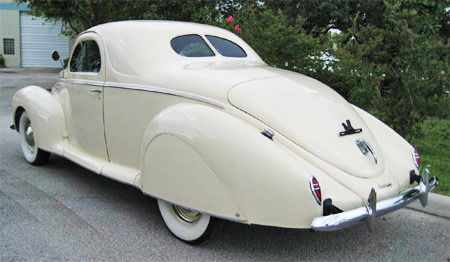 Rear view of the 1939 Lincoln Zephyr's streamline design shows the exceptionally long trunk. In 1932, at the ripe old age of 31, Eugene T."Bob" Gregorie joined Ford as a car body designer. Born in New York, Gregorie grew up with a love of ships and, following his school years, he apprenticed with several marine design firms. After the '29 market crash, however, the market for luxury vessels dried up and Gregorie turned his attention to automotive design. Edsel asked him to take a look at the Zephyr and recommend design revisions. Gregorie took the dream car concept and added more length ahead of the firewall as well as a pointy, rear-hinged "alligator" hood and Vee'd radiator. The new hood shape resembled an inverted, pointed ship's prow. In a 1937 ad, in fact, the Zephyr was set against a ship's prow with the charge: "Travel the Modern Way!" Gregorie also extended the wheelbase to 122 inches, added rear wheel fender skirts, and designed chromed front seat frames for the interior. With an eye towards cost management, he eliminated unnecessary materials and reduced the overall weight to 3350 pounds. In 1935 the revised design was patented. Also that year, Edsel had opened Ford's first internal styling department headed by Bob Gregorie. Streamline design is evident in the Zephyr's dash. Floor to dash consoles are nothing new. 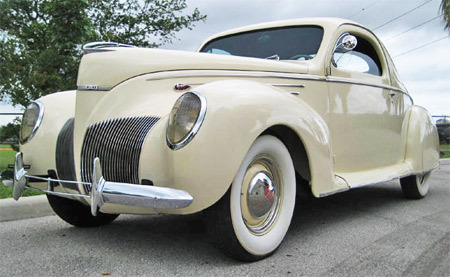 Introduced in November 1935 at New York's Hotel Astor, (1936 was the first model year) the Lincoln Zephyr was extremely modern, aerodynamic, smaller than other luxury cars but with a more efficient engine. One of its trademarks was a split-wing waterfall grille flanked by pontoon fenders with faired-in oval headlamps. 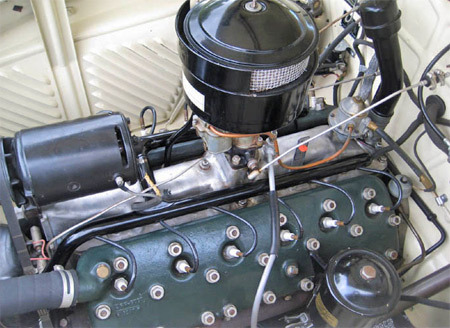 Its V-12 side-valve engine was essentially a larger version of a flathead Ford V8, owing largely to Henry Ford's insistence that the company re-use existing parts. It fell to Ford's Chief Engineer Frank Johnson to build it. It utilized aluminum alloy heads and a cast iron "monobloc" with exhaust cored between the cylinders. It displaced 267 ci and its power output was 110 hp, 2.43 cubic inches for every horsepower. It powered out at 3900 rpm and its flat torque curve made for superior top-gear performance. Tjaarda was a pioneer in monocoque construction; the windshield and rear window formed part of the structure. In 1936 only two models were available, the four-door fastback sedan which sold for $1320 and the two-door sedan coupe priced at $1275. In the first year of production Ford sold nearly 15,000 units, representing roughly 80% of Lincoln's total output. 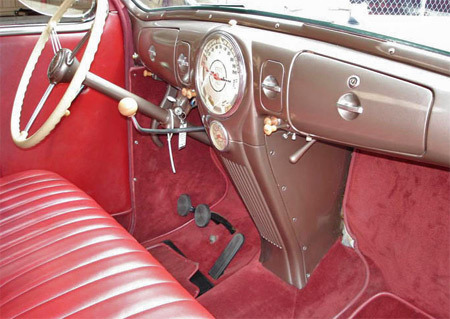 It had a wonderfully roomy interior and upholstery came in taupe broadcloth or tan Beford cord or leather. A 4:33:1 rear axle made for 0-50 in 10.8 seconds. The ride was comfortable at 75 mph but the car could reach 90 mph. Its typical fuel consumption was 16-18 mpg. Suspension was by transverse leaf springs and beam axles — front and rear. Its brakes were mechanical until the 1939 introduction of hydraulic brakes. It had an all-steel roof that sloped back to the rear bumper, interrupted only by a small, split rear window. In the first year of production, the Zephyr's V12 put out 110 hp @ 3900 RPM. Its design was spectacular but it was reported as "lazy" on the road. It had its design and mechanical problems, as well, and soon earned a reputation for service problems. It had poor weight distribution, was too light in the rear, and ran rough with a tremor in the steering wheel. It also had inadequate crankcase ventilation and undersized water passages. The exhaust passages through the cylinder block left hot spots. These deficiencies led to a host of problems: overheating, bore and cylinder warping, poor oil flow, excessive oil burning, rapid sludge buildup, water leakage, burnt head gaskets, ring wear, and crankshaft problems. As if that weren't enough, the '36 model had an awkward trunk feature known as the "Winchester Mystery House" trunk. From the rear drivers could only access the spare tire; access to luggage space was from inside the car via a fold-down rear seatback. By 1937 that problem was corrected with a tire bracket that swung away. Despite these issues, 130,000 Zephyrs were built between 1936 and 1942, with another 42,000 rolling off the line after WWII ended. Its positive attributes — areodynamic styling and affordable pricing — made it a popular favorite in its time and still today.